There might finally be some good news this year about the nation's dismal housing market. Or, at least, the bad news could stop. Either way, it will be welcome relief for current homeowners as well as for potential real-estate investors. Reasons to be optimistic have been sadly lacking since the housing bubble burst in 2006. For sure, last week we learned the widely watched S&P/Case-Shiller home-price index fell 1% in December, its fifth straight decline. The index tracks 20 major markets. But that figure belies real reasons to be optimistic, according to some experts. If they are right, it might make sense to jump into real estate. The trick is avoiding getting burned again, and it doesn't necessarily mean owning a home. First, let's recap the economic signs a bottom is close. Nationally, the cost of a house is the equivalent of about 19 months of total pay for an average family, the lowest level in 35 years. Prices usually average close to two years' pay, although that varies nationally. At the peak, midway through the last decade, a home in Los Angeles cost the equivalent of 4.5 years' pay. The average price has since fallen to just over two years' income now. That's well below its pre-bubble average of 2.6 years. This means average Los Angeles homes are cheaper in "real terms" than they were typically during the period 1989 through 2003. The opposite is true around the Washington beltway, where it will take 26 months of pay to buy a home, versus the historical norm of 22 months. In the end, it will be affordability that will drive people to buy homes. "Pricing is down so much in some markets that when you analyze renting versus owning it makes much more sense to own," says Michael Larson, a real-estate analyst at Weiss Research in Jupiter, Fla. It is definitely bullish. But what about timing? "Housing prices will probably bottom in 2011," says Scott Simon, a managing director at money-management firm Pimco in Newport Beach, Calif. He foresaw the housing crash, helping his firm dodge losses that plagued Wall Street. Mr. Simon says prices might dip another 5%. Still, in the scheme of things, that's small. 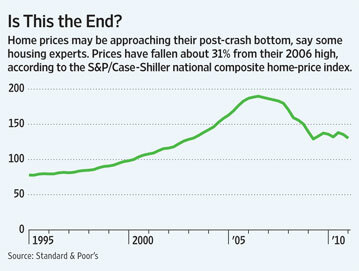 Consider this: In some markets, home prices have fallen by half or more since 2006. For instance, in once-hot Miami you can snap up an average house for under $166,000, according to recent data from the National Association of Realtors. That's down from $371,000 in 2006. Another 5% drop would take it to $158,000. Here's another sign the market is nearing a bottom: Investors have started to buy up houses and condos, in some instances paying entirely in cash. That's a far cry from the heady bubble days when borrowed money seemed the key to riches. The bubble-era speculators who got burned tended to buy at the peak and borrowed heavily to do so. When the crash came, they quickly saw their wealth erased. Take Miami again. Last year, more than half of all transactions were made entirely in cash, according to a recent report in The Wall Street Journal. That compares with 13% of deals in the last quarter of 2006, the height of the bubble. Similarly, in Phoenix 42% of sales in 2010 went to all-cash buyers, up threefold since 2008. It's a sign that these investors are betting on a rebound. 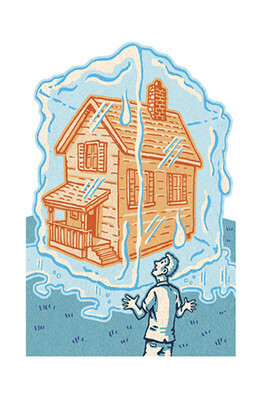 Investors buying at current prices are looking for deals, or so-called bottom fishing. They typically like to pay entirely in cash (or with a relatively small loan) to speed up transactions. That can be vital for an investor wishing to lock in a deal fast. If this is a turn in the market, then it might make sense to go out and buy a home. But, warns Pimco's Mr. Simon, "buy in areas you really know." Buy and hold. While the good news is that the worst of the housing crash might be over, the bad news is that the fast gains of the glory days of 2005 and 2006 won't be back any time soon. So to cover the costs of buying and selling, and what could be a prolonged recovery, plan to own for more than 10 years, explains Jack Ablin, chief investment officer at Chicago-based Harris Bank. Also remember that borrowing money to buy a house can still be risky. If you pay for a $100,000 property with $20,000 cash and borrow the rest, a dip in the value of $20,000 would leave you with zero equity. On top of that, you'd have to pay to maintain and repair the property, something not necessary when renting. There are other ways to benefit from a real-estate rebound than directly buying a house. Such investments include stocks, mutual funds or exchange-traded funds. Unlike homes, which typically cost tens of thousands of dollars, these financial investments can be made in smaller amounts and typically are easy to sell. Weiss Research's Mr. Larson says although new homes are oversupplied, home builders might benefit from a rebound as the situation rights itself. Rather than pick individual stocks, he says, it probably makes sense for small investors to pick broader investments that hold many different stocks. In particular, he points to the SPDR S&P Homebuilders ETF (XHB), which tracks a basket of home-builder stocks. Mr. Larson also highlights specialized mutual funds such as the Fidelity Select Construction & Housing fund (FSHOX), which tracks home builders as well as home-improvement retailers likeHome Depot and Lowes that would also likely benefit from a housing recovery.